Remember this Multigrain pancake mix.. It makes amazing pancakes! 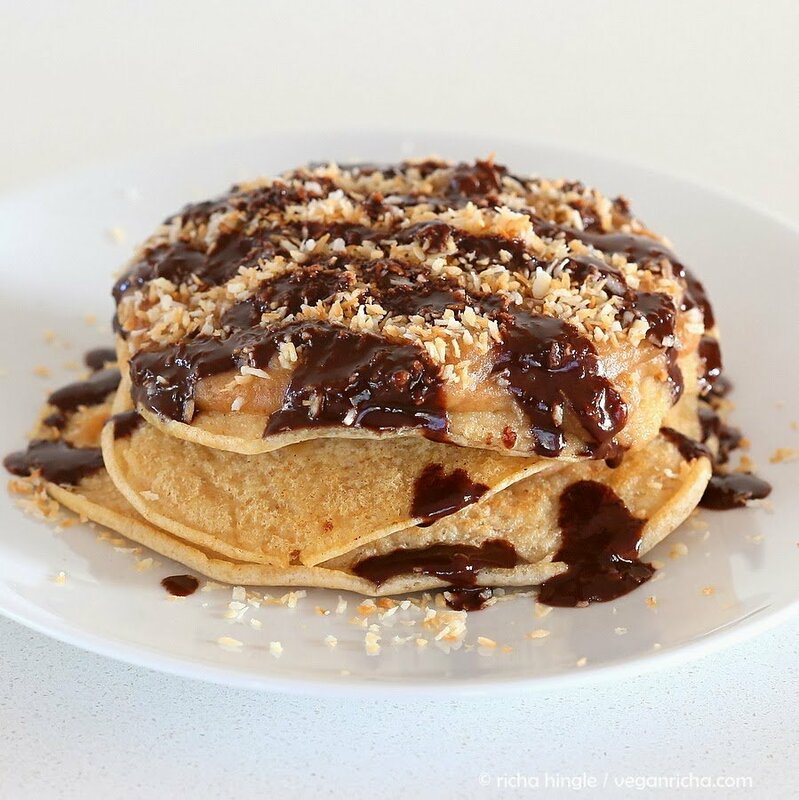 These Samoa cookie pancakes are just the right decadent with salted date caramel, toasted coconut and chocolate. Easy to put together and dare I say very addictive. The pancakes can be easily made gluten-free with you favorite gluten-free pancake recipe, or try my mutligrain Gluten-free Pancake Mix. I had my temporary crown fitting yesterday that took like 2.5 hours and squeezed all the energy out of me. I am still dazed and my brain is working on some half somewhere mode. So less words, more pictures, more ideas and recipe today. these Cinnamon Rolls with maple coffee icing. yum! 1 cup my multi-grain Pancake Mix use my gluten-free pancake mix to make gf. Add the lemon juice to 1/3 cup water. Add the almond milk, water, oil, cinnamon, vanilla to the dry pancake mix. Mix until just combined and let sit for 2 minutes. If the mixture feels too thick (it is thicker than plain flour pancake mix), then add a tablespoon more water. Heat the pan on medium heat. Grease with a little oil. Once the pan is hot, pour ladle full (1/4 cup) of the pancake batter for each pancake. Spread the batter a bit with the ladle if needed. Cover the pan for 2 minutes. Remove cover and continue for another 2 or so minutes until the top is bubbly. Flip and cook for another 2-3 minutes. Reduce head a bit to low-medium while cooking if the pan gets too hot. Or use your favorite pancake mix recipe, and adjust liquid accordingly. Dry roast the coconut shreds in a pan on medium heat for a few minutes until golden. Soak the dates for 15 minutes in hot water. Drain then blend with all the ingredients into a smooth paste. Use 2-3 Tablespoons of water or as needed for desired consistency. Omit salt for plain caramel. You can make the caramel before hand and refrigerate for upto 3 days. Melt 1/4 cup chocolate chips on double boiler with a Tablespoon almond/coconut milk. Add more milk if you like a more thinner chocolate drizzle. Or mix equal amount of cocoa powder, maple syrup into a smooth mixture and use. Prep the toppings before making pancakes. 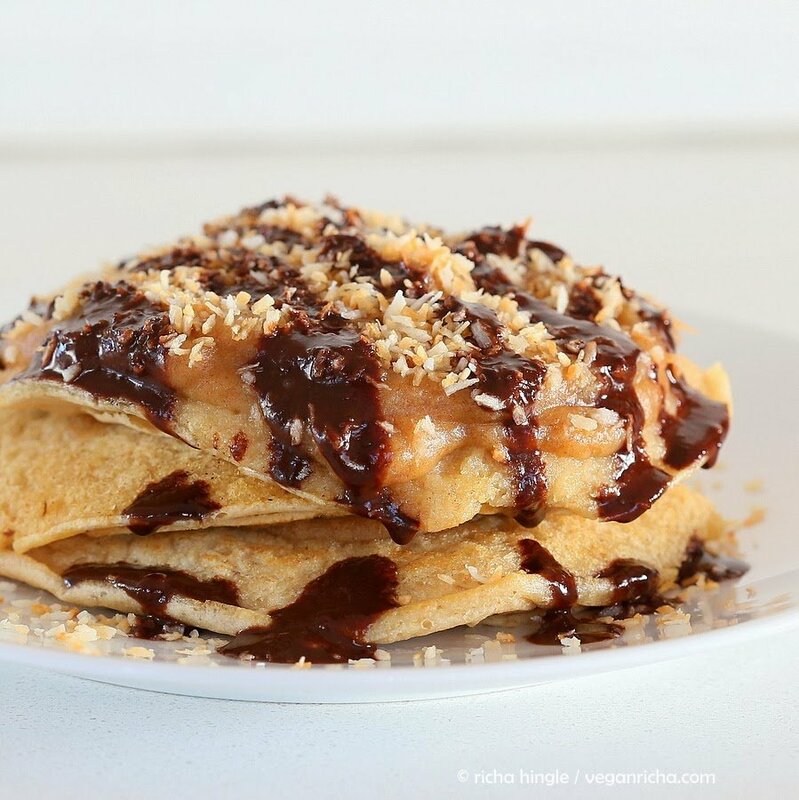 Top each warm pancake, or just the top pancake with a generous amount of the date caramel, then sprinkle with toasted coconut and drizzle melted chocolate. Use maple syrup if needed and serve. Sunday is my day to eat whatever I want – and I always start with a big, delicious breakfast. These look like a perfect way to begin an indulgent day! its not that decadent if u hold the chocolate a bit. hubbs who usually doesnt like pancakes because they are too sweet loved these! This is the second blog post in a row featuring droolworthy pancakes. I think the universe is trying to tell me I need to whip up a batter. And who am I to disagree? You’ve done it to me again. You just keep posting deliciousness. My husband has a Sunday morning ritual. Pancakes, plain. All he likes are straight up pancakes, nothing fancy. Something tells me that even though he would probably kill me for making these on a Sunday, if I presented him with a plate of these on say, Saturday, he would not object. When I first saw the title my thought was it sounded like something that should be on the Sutra menu! 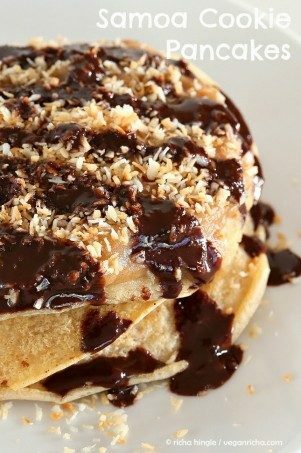 I’m a little obsessed with waffles at the moment and I can see caramel and chocolate covered waffles in my future. Holy cow! These look amazing. Samoa cookies were definitely my favorite girl scout cookies pre-vegan. My mom used to buy packs of them when they sold them and we would freeze them so they lasted. 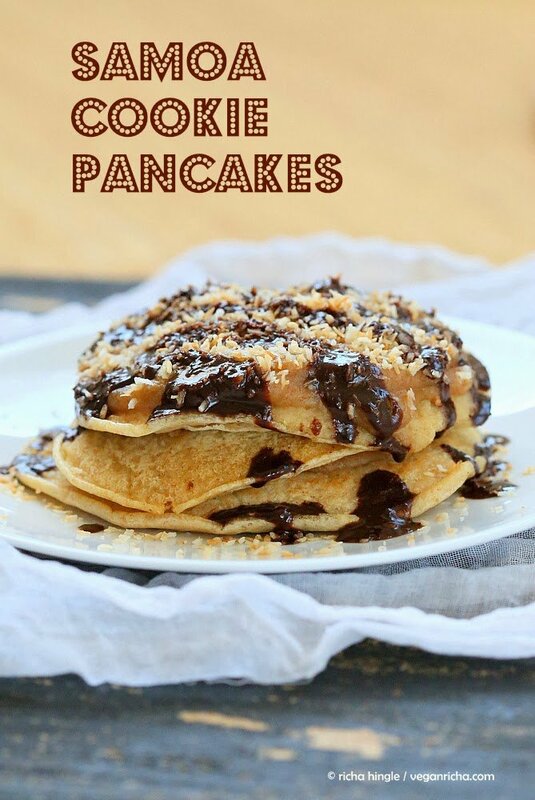 Friday is my Sunday, and Larry is the pancake maker, maybe I can convince him to whip these up. (probably won’t take much convincing) Hope you feel better after the ordeal at the dentist. ugh! I’ve thought about you today. I was looking for a fixer in India b/c I’m really curious about the animal welfare in India, but I hope one day I will visit it. Have you been there and where have you been to? Mmmm, I want some fluffy pancakes for breakfast – it’s so hard to make something like this here in Buenos Aires, my kitchen doesn’t have a mixing tool, blender nor a processor, I’m sure I can mix the ingredients easily with a table spoon. The date caramel & chocolate drizzle = amazing. I want to eat breakfast with you one day! Mouth watering, delicious one..my dad love this type of recipe, I’ll definitely make it for my dad…..Hope he liked it. Wow, these pancakes should not be legal! Samoas are my favorite Girl Scout cookie ever! Wow, this is such a crazy ridiculous amazing breakfast! You should probably open up a vegan brunch spot and serve these. I would fly to Seattle for them! damn, girl. these look killer! This looks so delicious and flavorful! I love cakes, and I definitely need to try it like this. I can’t get enough pancakes lately! These look incredible Richa, I so need to try that date caramel sauce. Exactly what I needed – a new recipe to try this morning to put off more homework! Can’t wait! These are just ridiculous! I mean, wow! Oh yes a girl after my own heart- fantastical Richa! These look totally decadent. Are you sure they are healthy???? You have the most amazing recipes – and the photos make them look more crazy amazing!! !